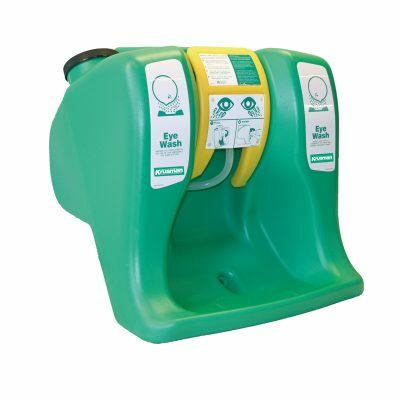 Self-contained portable eye wash unit that uses gravity to deliver water through dual spray heads. Unit delivers over 53 liters of water for 15 minutes. The plastic tank can be installed in a wide variety of locations where potable water is not available. It must be filled up with clean potable water and sterilising fluid must be added. Unit shall be inspected regularly and the water must be changed at least every sixth months. To order a bottle of sterilising fluid specify art. no KN 1540BA.